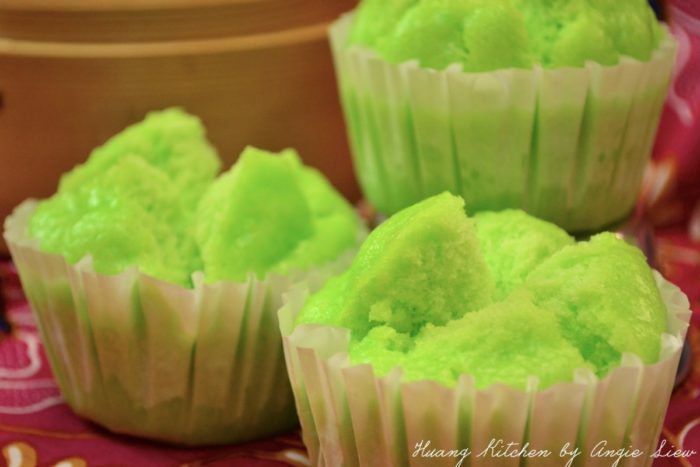 Steamed Chinese Matcha Muffins (Green Tea Huat Kueh 绿茶发糕) is a light, fluffy and pillow soft rice cake. As the name implies, it is steamed instead of baked. 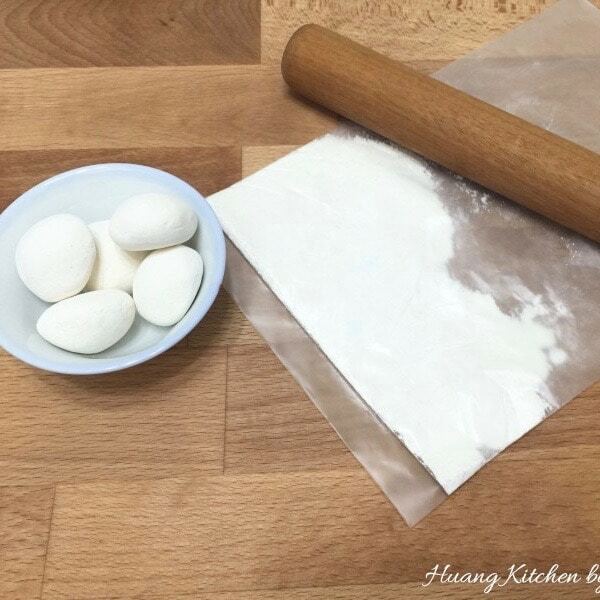 The process and duration of making these rice cakes may be slightly longer, however the end results are definitely satisfying. 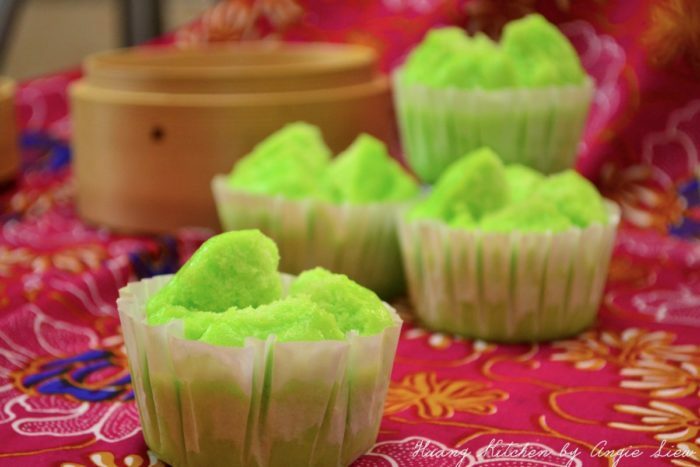 These otherwise simple steamed rice cakes (Huat Kueh 发糕) are made special with addition of matcha (green tea) powder. 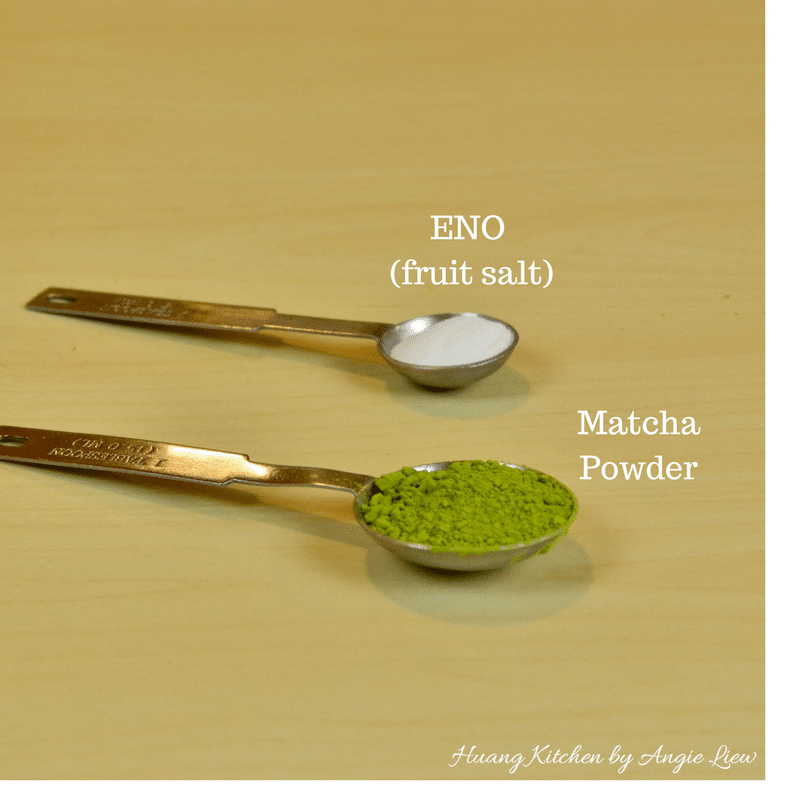 The green tea powder gives the rice cakes a unique rich and refreshing look and taste as well as sweetness. The green tea flavour is apparent but not overpowering. 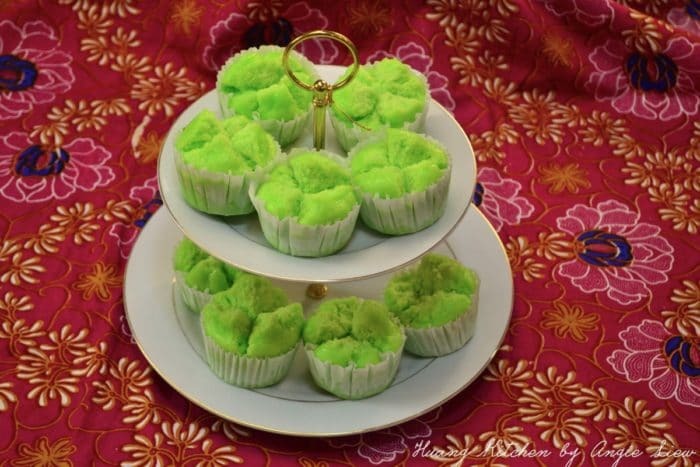 The aroma is further enhanced with a touch of pandan flavour in it. A definitely delicious Huat Kueh recipe to try at home! As usual, enjoy! 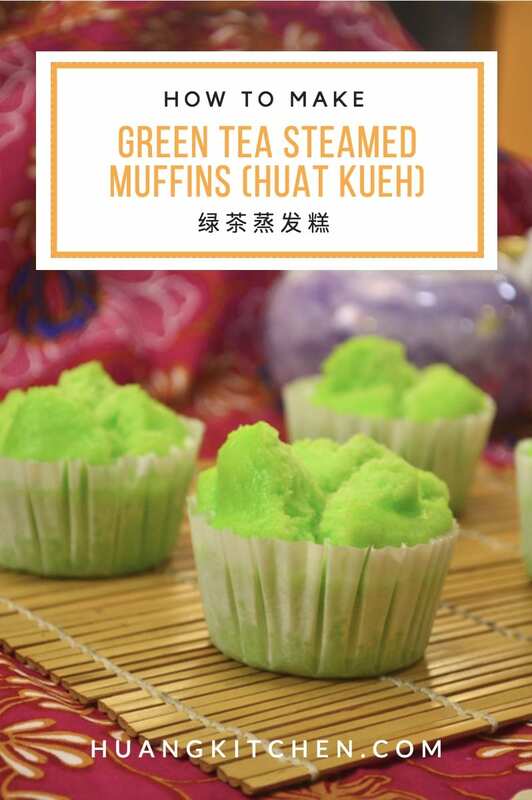 Steamed Matcha Chinese Muffins (Huat Kueh) 绿茶发糕, a delicious steamed delicacy. 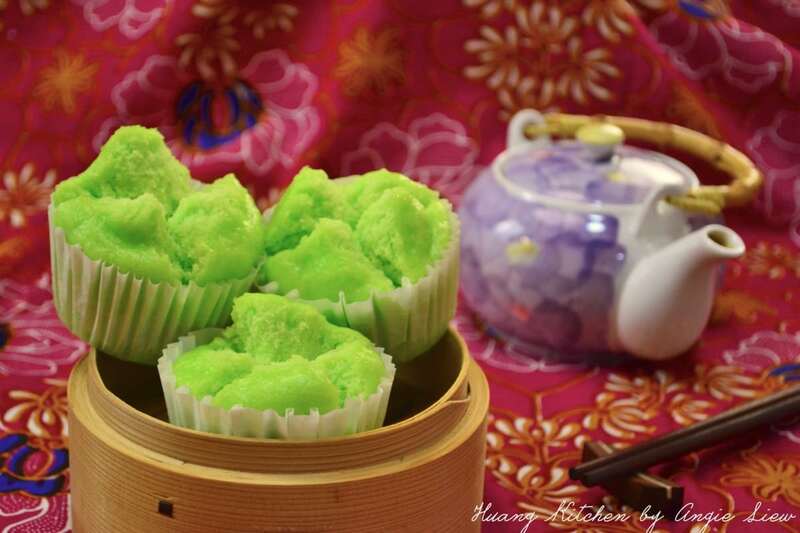 Soft and fluffy steamed rice cakes, filled with the signature fragrance of matcha green tea. 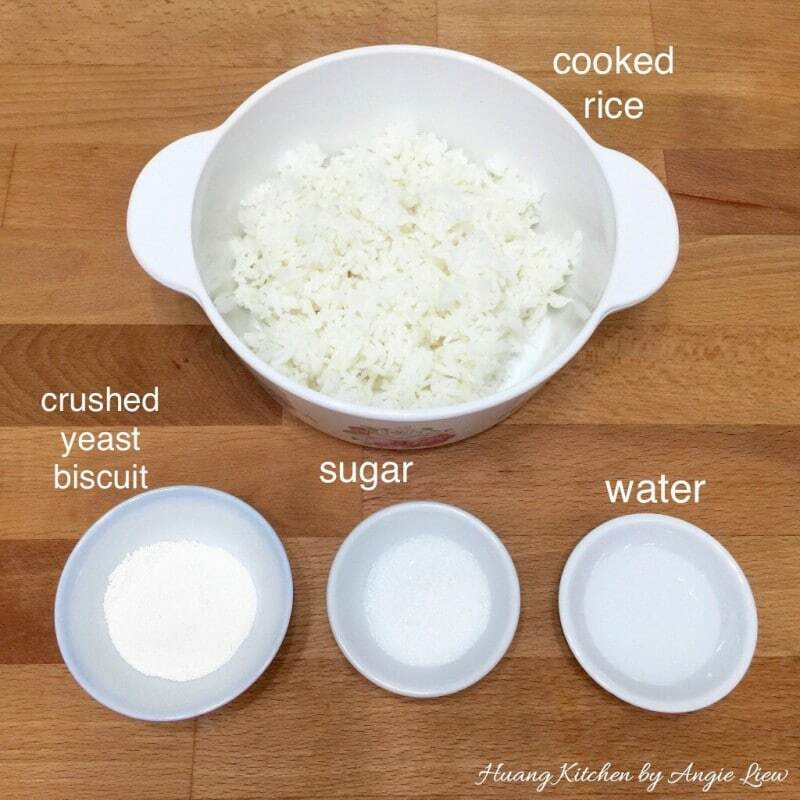 Sprinkle the pounded sweet wine yeast on top of the rice followed by sugar and water. Mix well. Cover and leave to ferment for 48 hours (2 days) at room temperature. 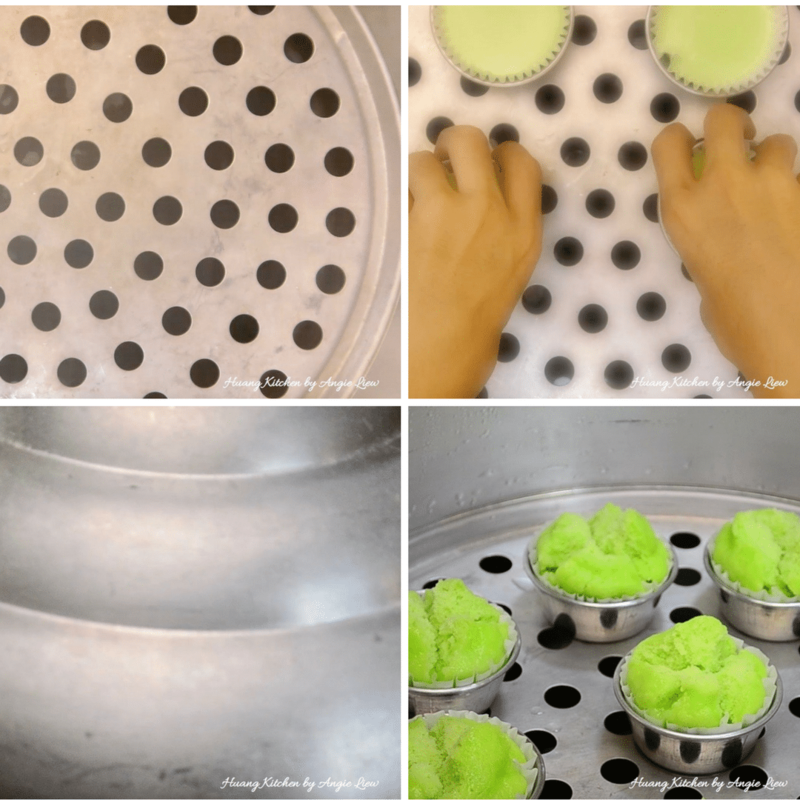 Meanwhile make pandan juice by blending pandan leaves and water. Strain the juice and top up with more water to 600ml. 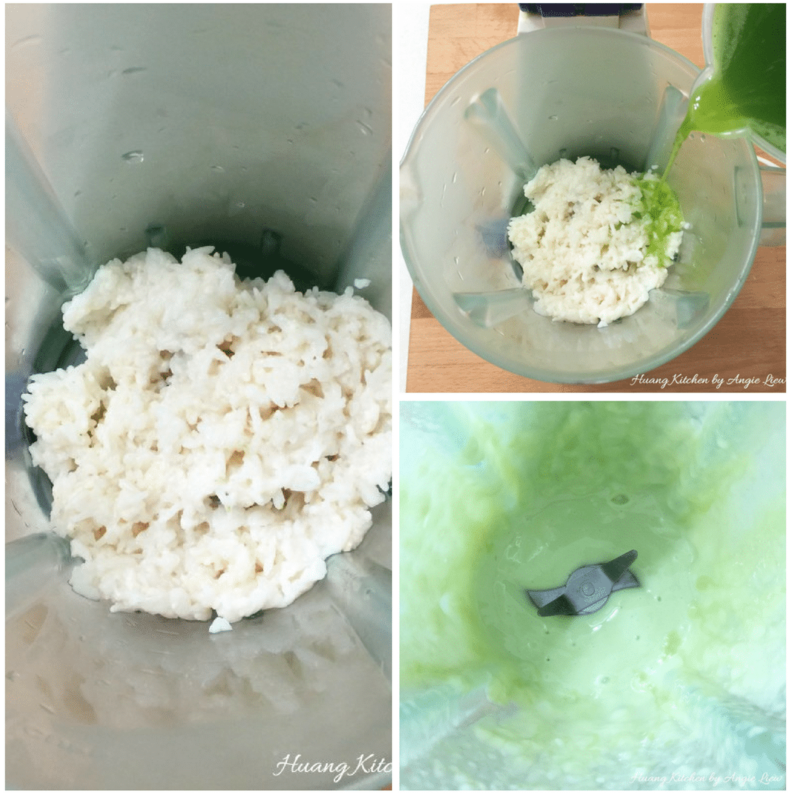 When ready, blend fermented rice with about 1 cup (250ml) of the pandan juice. Then pour in the balance 350ml and mix well with blended rice. 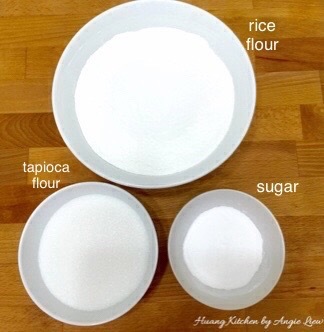 Mix the rice flour, tapioca flour and sugar in a large bowl. Add blended rice mixture into the flour mixture. 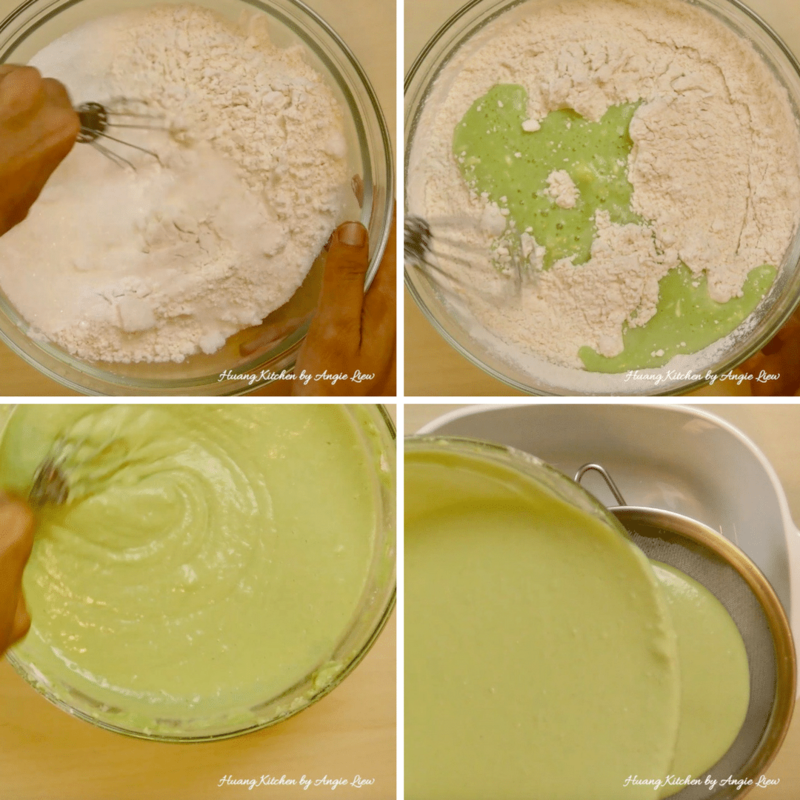 Stir until it becomes a smooth batter. Then strain the batter into a clean pot. After fermenting for 11 hours, add in green tea powder and ENO. Stir to mix well. 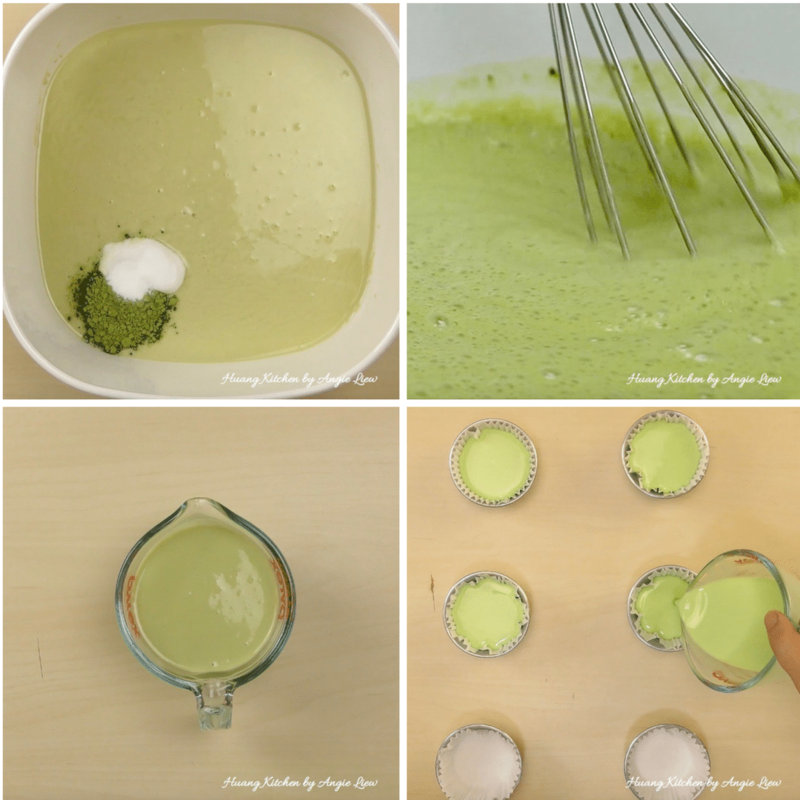 Immediately transfer the matcha batter into a measuring cup for ease of pouring into steaming cups. Pour batter into lined steaming cups until 90% full. Place filled steaming cups in prepared steamer. In batches, steam the batter in steaming cups over high heat for 15 minutes in a covered wok. And we're done! Remove from heat and leave to cool. Then remove the lined rice cake from the steaming cups. Cool before serving with a cup of hot chinese tea or roasted green tea and Enjoy!